Going blonde is one of the most sought after beauty trends. If you decide so, you may want to bleach your eyebrows so that they don’t remain dark and contrast with your hair. So, what options do you have? You can use makeup, use dye or even go with natural options such as hydrogen peroxide, honey and lemon juice. Below, we have discussed all these options to help you lighten eyebrows naturally at the comfort of your home. You will also learn how to get lighter brows with makeup. Blond hair rocks, but having darker brows can make you look a little unnatural. Unless you want to create a very serious contrasting effect on your face, it is a good idea to go blonde if you have pale hair. Fading off the color of your eyebrows with makeup is the easiest and fastest fix when you want a softer look as opposed to the bold dark eyebrows. Most people dye their hair but almost always forget that their eyebrows still scream the original hair color. For some, lightening eyebrow hair may sound like a crazy idea but this is the easiest way to strike a balance between the big hairs of the head and softer smaller hairs of the brows. However, matching the two can make you look very plastic and fake. Experts advise that the best way should be going several shades lighter than your hair color. This creates a warm balance and might help create the impression of a flat face. Permanent bleaching of the eyebrows is a long time commitment that no one wants to get into as these cannot be regularly re-dyed. If you are not sure what color is perfect for your new hair dye, begin by trying out different temporary colors using brow pencils, powder and tinted brow gels. To pull off this look, trim or wax off your tweeners. A bushy brow is a no-no. Try to get a trim clean look, so that you don’t end up with a washed off face. To temporarily lighten eyebrows, try a colored eyebrow gel for an evening look. If you have very dark brows, tinted eyebrow gel works best. Use a simple matte powder to give a soft lightening effect. For a glam look, try shimmery powder with glitters. To fade them off using a brow pencil, choose a pencil that is shades lighter than your hair color. Note that a pencil will add color to the skin below the eyebrows. When the dark color of the eyebrows and the lighter one of the pencil blend, it creates an impression of a lighter eyebrows. Trim or shape your eyebrows. They should not be too thick or thinned out. With a small mascara brush, brush concealer that matches your skin tone through your eyebrows mimicking the hair growth. This takes out the original brow color giving you a lighter one that is similar to your complexion. Using a light brow pencil in a color that you choose, fill in the hair with proper color and bring back a little color to the hair so that you don’t look washed out. The color of the pencil that you choose should be a few shades lighter. For example; use a warm brown pencil for dark brown brow hair. Brush through with a simple brow gel to lock in the color and ensure that the product you put on does not run. The recent color and contrast trend looks great. However bleached or tinted brows do not always look good on everyone. Many people dread salon treatments for toning down one or to shades as no one is ever sure if the outcome. 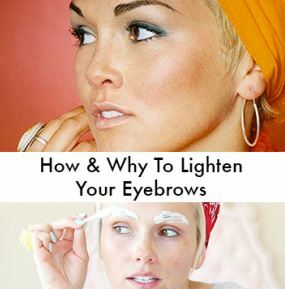 If you want to bleach eyebrows naturally at home, you have probably tried commercial bleach or hair dye and got awful results. Are there natural options? For those weary of hair dye and bleach like I am, you will be glad to know that there are safe ways to lighten naturally at home. Those commonly used are; raw honey, lemon juice and hydrogen peroxide. Wait! Am not sure whether Hydrogen peroxide is considered natural but it can be safely used at home with a few safety precautions. It is the most effective but comes with more risks and possibilities for allergies. Lemon juice is as effective as it is on hair. Not as intense and you might need to use it several times to get preferred results. It strips off the natural melanin pigment leaving your brows a shade lighter. This reaction is not as intense unless you walk out in the sun still wearing lemon on your eyebrows. Lemon is a great commonly used natural bleach. The bleaching component in them is really mild making them safe and effective for natural lightening. However, some believe that lemon is not the best for bleaching hair and eyebrows because it has the tendency to make hair brassy and turns green when mixed with chlorine in the pool. It also makes them rough, sticky and attracts bugs. The best thing about bleaching eyebrows with lemon juice is that the health risks are minimized compared to bleaches and dyes. It is the best option for those with allergies to hair dye and commercial bleaches. A mixture of tea and chamomile tea can help soothe and get rid of the dry sticky feeling. This might however be tedious for some people and it might need to be done several times to achieve the desired effect. It is important to NOTE that the bleaching is becomes intense when you go out in the sun and the outcome might be an unpleasant green color. Heat or sun can however be used to an advantage to activate, intensify and speed up the reaction for better results. Avoid getting the juice into your eyes as it can cause irritation. Keep checking as the reaction works quickly and wash off once you achieve the desired shade. Raw honey contains traces of hydrogen peroxide that is slowly released when you dilute it with water. There are some people who swear to have got positive results after using a mixture of honey and cinnamon to lighten eyebrows. However, I bet this is the last thing you want close to your eyes. Cinnamon can be very painful when it gets into the eyes. Honey with cinnamon is commonly used in bleaching hair or creating highlights. This mixture is however not safe to be used around the eye area. Honey has a tendency to become sticky and dry. While honey and water recipe is the most recommended honey recipe for lightening eyebrows, how to keep the honey wet and moist while it is still on your eyebrows is the problem. The small traces of peroxide make this recipe slow and ineffective for those who have thick, coarse eyebrows. Henna is a natural alternative that can be used in place of hair dyes and tints to lighten eyebrows. It may not work on every hair type especially the dark, thick and coarse hair type. Try to put on oil first to avoid staining your skin. Use a mascara brush to minimize contact with the skin. Do not leave it on for too long. 20 minutes should be enough to give a nice shade. Note that the color effect does fades out too quickly making this not the best natural brow lightening option. Hydrogen peroxide is a bleach in most homes and has many uses including whitening dark skin. It is the safest active bleach to use for eyebrow lightening. You should however be very careful not to get any into your eyes. Lightening eyebrows can give your face a whole new look. For those who are not sure about professional bleaches, hydrogen peroxide is the easiest, safest and most natural way to bleach eyebrows. Eyebrows unlike hair are small fine hairs that need not take all your energy when lightening. It is really easy and you do not require bleach. Bleach also needs to be redone every few weeks for any small re-growths. Bleach and hair dyes are not the best for bleaching eyebrows. If not careful, this can hurt your eyes and even cause blindness. The FDA does not recommend hair dyes on eyebrows or even lashes. 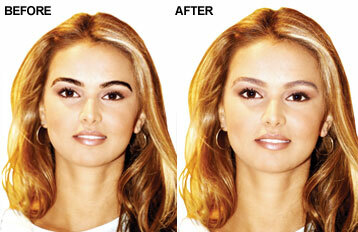 Lightening eyebrows without bleach is easy, safe and gives you the most natural results. 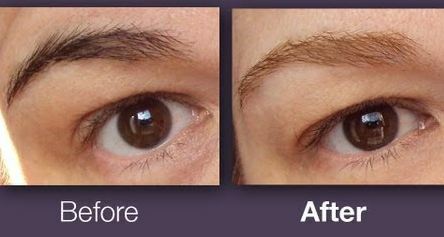 There are many ways to lighten eyebrows naturally or with a simple touch of makeup. It might be a little tasking to keep changing your brow color to match your hair color every time you have a new hair color. This might be good for seasonal makeup change or to add a fun side to your photos. The most common way of lightening eyebrows without bleach is using small makeup tricks such as using concealer powder, brow pencil, and brow gel pencils. Natural ingredients found at home such as honey and lemon can be temporary ways to lighten your eyebrows. Jolen cream bleach original is a favorite for those who want to lighten excessively dark hair including brow hair. It is amazing for eyebrows. It is less messy and comes with an accelerator powder and cream which are mixed in the ratio of 1:2 respectively. Jolen cream bleach sensitive is made for sensitive skin. It is blended with aloe vera, great for those with sensitive skin. Dying and tattoos for eyebrows is the easiest way to maintain a perfect brow without having to trim, wax or tweeze every other time. When you tattoo your eyebrows, the skin below the fine hairs can be very dark and stand out way after the area has healed. Simple methods like application of retinol cream can help increases the regeneration of new cells. This will cause the tattoos to lighten over time. Do this every other night you achieve the desired effect. Remember to use sunscreen as retinol makes your skin sensitive to sunlight. Permanent hair dye or other types of eyebrow tints can give very devastating results. If you just had your eyebrows tinted, and you got that Halloween look, hydrogen peroxide should be able to help you achieve the desired shade over time. You may consider hydrogen peroxide eyebrow lightening in combination with brow gels and pencils as this will help counter the effect on both the skin below and the fine hairs of the eyebrow. Hydrogen peroxide has strong astringent properties that will make your brows lighter over time. Just dab a little with cotton swab and apply over your eyebrows. This should be able to bleach your eyebrows to create a lighter shade over time. Be careful not to get any into your eyes as this can cause blindness. If worried about the effects of hydrogen peroxide, use clarifying shampoo. Mix clarifying shampoo with equal parts of water and brush the mixture over the brows. Just as it is meant to remove residue from your hair, it will help remove excess dye and bleach your eyebrows over time. Be sure to apply this to the eyebrows and not the skin around. Do not put on too much. The excess can spill over into your eyes. Do not wash your face with bleach on, to avoid getting some into your hair. If your brows appear orange or reddish, DO NOT freak out. This is a normal reaction that happens especially in brunettes when you remove the normal brown hair pigment. If you are one of them, try to find out what color is best for you and be careful not to leave the hair dye on for long.